The early failures of such writerly geniuses as Seuss, King, and Rowling are clarion calls to keep trying. •	Accounts vary, but Theodore Geisel/Dr. Seuss got between 20 and 43 rejections before breaking through with his quirky new style of picture book, And to Think That I Saw It on Mulberry Street. •	After his 30th rejection Stephen King threw away his Carrie manuscript. His wife rescued it. He revised and resubmitted yet again…and, well, you know the rest. •	Despite quick inspiration, JK Rowling spent five poverty-laden years writing Harry Potter’s story and getting an agent. A year of rejections from all 12 major houses passed before Philosopher’s (Sorcerer’s) Stone was accepted. 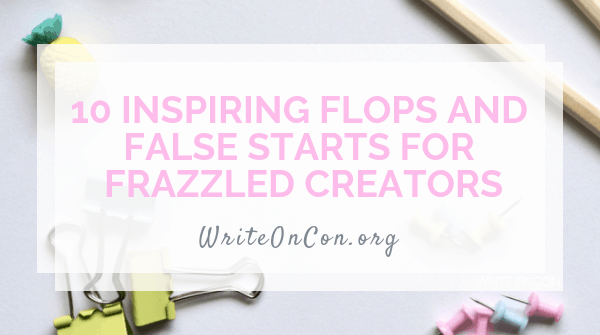 Yet if you’re closer to baby steps than a bazillion publishing credits in your writing career, it may feel daunting (or even a bit silly) to think about catching up with such publishing kingpins. So let’s ignore them and step outside of writing. Consider these 10 endeavors (mis)managed by people who were frazzled, had false-starts, or just flopped before finding success in their fields. Their milestones and tiny moments may unfrazzle or reboot your writing aspirations. He was called lazy for preferring to read, write, and cipher over farming. He started the Black Hawk War as captain but finished as private (the lowest rank). He ran various businesses–into the ground and went bankrupt twice. His political career was hindered by 26 campaign defeats. Trouble infiltrated his presidency at every turn until the war was won. Some things truly are worth the wait. Albert Hyman’s 1932 hand-cranked external pacemaker was strictly for animals. Preliminary human pacemakers were TV-sized. Zoll and Baaken developed small, but un-implantable ones during WWII. Then Wilson Greatbach mismatched a resister to a circuit in a heart rhythm recorder. The mistaken pairing made a heartbeat sound so Greatbach miniaturized it. Implanted first in 1958, the new pacemaker lasted three hours. Its replacement lasted two days. The patient needed 26 replacements (but he lived to 88!) Generations later, electrophysiologists still are refining the options. Even the crudest beginnings develop with time (and team). In 1957, Marc Chavannes and Al Fielding designed it as wallpaper. Failure popped that dream. The engineers marketed it as greenhouse insulation. Sales never bloomed; Bubble Wrap® went dormant. Until IBM used some sheets to protect a new computer during shipping. When all feedback points to pivoting, then pivot! Founded in 1889 to make handmade gambling cards, Nintendo evolved to produce playing cards, toys, and then electronic game devices. Its main competition waned, yet in 1985 Nintendo’s biggest system wouldn’t sell. They doubled down on editorial and technical quality. By 1986, new characters, Mario and Luigi, transformed gaming. Be flexible. But mostly, tell (er…show) a great story with engaging characters. The (only) three lab workers at Rocket Chemical Company needed a water displacing formula for aerospace industry use. Thirty-nine tries and it still wasn’t working. But the 40th was the charm. Celebrating the process, they named it WD-40. Get it? 40 tries to succeed at water displacement. Trust your process – beyond that very last failure. He dropped out of Harvard then co-founded Microsoft with Paul Allen. They launched something called Traf-O-Data. It failed. But it served as a great first step for all the rest. Sucky first drafts can be fixed (but ditch the bad titles). Check the dictionary for ‘disaster’ and you may see a photo of this phone. Way worse than remaindering, it almost burnt down Samsung’s house — figuratively and perhaps literally. Yet Samsung recovered. The Galaxy Note 8 was a safe success and the 9 was released in August 2018. Going down in flames is not the end. An editor fired Disney for lacking imagination. Disney sank several businesses; he suffered bankruptcy. He learned movie-making, but early releases like Sleeping Beauty, Pollyanna, and Alice in Wonderland were box office failures. Learning more, he opened Disneyland in 1955. Just before opening day, a plumbers’ strike derailed two essential systems. With 10,000 free ticket holders arriving, Disney chose working toilets over water fountains. Learn slowly. Kill your darlings – even ‘essential’ ones – quickly. After retiring from a long, varied career, Harland David “Colonel” Sanders decided to sell chicken. But his recipe was rejected 1,009 times before a restaurant agreed to try it. It’s never too late to try anew or again. The greatest of all time (hush, LeBron fans) was cut from his high school basketball team. After a zillion college and pro basketball titles, awards, medals, and dollars Michael switched to pro baseball instead. He failed, but he went down swinging (and the NBA welcomed him back). Don’t undersell yourself. Don’t rest on laurels. Post your mantra, quote, or reminder where you’ll see it often. But first, share it with all of us in the comments box. Like what you read? Please share via social media. Good stuff, Katie. My personal mantra is “Only I can do what I do.” Only I can draw what I draw and write what I write. Only you can do what you do. I learn from others, but I don’t compare myself to them. Just imagine if I were trying to outdo Dr. Suess at what he did! I’d have to give up writing and drawing in despair! ? Ah, the wisdom of simple self-awareness! I agree, over-comparing is like over-thinking – both impede progress (or worse). Thanks for the thoughtful response.